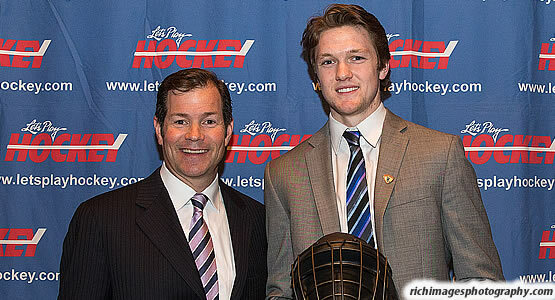 TAMPA - Boston College junior goaltender Thatcher Demko has been named the winner of the 2016 Mike Richter Award as the most outstanding goaltender in NCAA men's hockey. Demko was presented with the award during ESPN's Talk Frozen Four & #CawlidgeHawkey event at Champions Sports Bar at the Tampa Marriott Waterside Hotel. The award is named after New York Rangers great Mike Richter, who spent 14 seasons with the club, leading the franchise to a Stanley Cup championship in 1994. Richter was inducted into the U.S. Hockey Hall of Fame in 2008. Demko, who was also tabbed a Hobey Baker Award Hat Trick finalist on March 31, became the third-ever Richter Award winner. Connor Hellebuyck of UMass Lowell and Zane McIntyre of North Dakota won the 2014 and 2015 Mike Richter Award, respectively. Heading into the Frozen Four, the 6-foot-4 backstopper possessed the nation's second-best save percentage (.936) and seventh-best goals against average mark (1.85). He accrued a .763 winning percentage, third best in college hockey, and his 27 overall wins were also third best. The San Diego native surpassed the school records for shutouts in a season with 10 and is two blankings away from tying Cory Schneider's (2004-07) benchmark of 15 for the career record. His 10 shutouts is the second most in college hockey history for a season, tying David McKee (Cornell – 2005) and Ryan Miller (Michigan State – 2001). Demko was two shutouts short of matching Greg Gardner's (Niagara) record of 12 set in 2000 for the all-time mark in a college hockey season. At the onset of the season, Demko matched history after posting six shutouts in seven starts (Oct. 16 - Nov. 8, 2015), stringing together a pair of three-game shutout streaks. Demko's historic run tied Blaine Lacher of Lake Superior State for posting six shutouts in seven games, marking only the second time in the history of college hockey something of that magnitude has been achieved. His first shutout streak started in the third period at Rensselaer on Oct. 11, 2015, where he played shutout hockey for 206 minutes and two seconds (206:02), denoting the 20th-longest stretch of zero goals allowed in the history of the game. Demko's second run started in the third period of the Denver contest on Oct. 30 and spanned to the second period against Michigan State, surpassing his previous total and posting another 208 minutes and 36 seconds (208:36) of scoreless hockey. That mark is the 17th-best stretch in the history of the game. Demko's scoreless string of 208:36 is third longest in school history behind Scott Clemmensen (254:23 – Jan. 9-24, 1998) and Cory Schneider (242:19 – Jan. 13-27, 2006). The 2014 draft pick of the Vancouver Canucks is 62-25-10 (.691) with a 2.07 goals against average and a .928 save percentage (2,601 saves on 2,803 shots) for his career. Demko was also honored as the Hockey East Co-Player of the Year, Hockey East First-Team All-Star and All-New England recipient as part of his sterling junior campaign. Goalies on the Mike Richter Award watch list are chosen by members of Let's Play Hockey, utilizing both past performance and future potential. The four other finalists for the Mike Richter award this year were Kevin Boyle (UMass Lowell), Cam Johnson (North Dakota), Charlie Lindgren (St. Cloud State) and Alex Lyon (Yale). All five finalists combined for a 1.77 goals-against average, a .935 save percentage and a grade-point average of 3.0. About Let's Play Hockey: In its 44th season and based in the Twin Cities, Let's Play Hockey is the longest-running hockey newspaper in the U.S., serving the largest hockey market in the nation. Let's Play Hockey is published 29 times a year – weekly during the hockey season and monthly during the offseason. About the Herb Brooks Foundation: The Herb Brooks Foundation is dedicated to growing the game of hockey and giving the game back to the kids. Founded in 2003 by Dan Brooks and Kelly Brooks Paradise, Herb's family and friends created the foundation to preserve his legacy by continuing his life's work by growing the game by "making hockey fun for kids and letting them learn to love the game the way we did."